We make choices, every day, about how to spend our time. Most of our decisions are small, but over time they add up, and eventually they become decisions about how we’re spending our lives. If we work with a team, our coworkers make choices that affect our time, too. They send us emails. They stop by our desk. They invite us to meetings. Most of their decisions are small, but “they” are not just one person, so the effects of their decisions add up quickly. There’s another group of people whose decisions have a huge effect on how we spend our time: our managers, executives, and leaders. With a comment in a meeting, a quick email to the team, or an unrealistic deadline, our bosses can sway schedules, redirect projects, and ruin weekends. This can create big problems, but it’s also creates opportunity. By rethinking a few decisions, leaders can give their teams the thing they value most: time. I’ll never forget the experience that showed me exactly how the leader-team time dynamic works: It was a meeting with Marissa Mayer. In 2008, I was designing advertising products at Google in Chicago. I got the job when FeedBurner (where I worked) was bought by Google. After the acquisition, my job title stayed the same, but everything else changed. For the first time in my young career, I was going to lots of meetings, and my job had become as much about convincing, cajoling, and coordinating as it was about designing. My manager was the brilliant and inspiring Graham Jenkin. His office was nearly 2,000 miles away, but Graham was always looking out for me. One day, Graham told me about a team in Mountain View that was working on something called Google Help Forum—a way for customers to ask questions and get answers about Google. They needed some design help, and Graham thought this project was a good way for me to meet Googlers on the West Coast and try my hand at designing a consumer-facing product. With Graham’s support, I took on the Google Help Forum as a part-time design project. It went fine, and the project was unremarkable apart from one feature: Since the forum would be a part of Google.com, my work had to be approved by Marissa Mayer. In 2008, Marissa was a vice president at Google, and one of her jobs was to personally review and authorize every change to Google.com and its direct branches (like News, Finance, Help, etc). She had a reputation as a smart, passionate, forceful, and somewhat feared decision-maker. During two weekly meetings, teams would present proposed changes and get Marissa’s critique, direction, and—hopefully—approval. At the appointed time, my team showed up for our review and presented our work to Marissa. I don’t remember what she said or how many changes we had to make as a result. In fact, my memory of the meeting is a little fuzzy. But two details stand out with crystal-like clarity. The first is a bowl of grapes. Marissa was at the head of the table, sitting cross-legged in a swiveling desk chair. She was snacking on green grapes, plucking them one by one out of a white ceramic bowl. I’m not sure why this was surprising at the time or why it has stuck with me all these years. Maybe it was the contrast between Marissa’s casual confidence and the anxiety felt by the rest of us around the table. At Google, a company known for informal dress and inclusive consensus, this was a rare high-stakes meeting, where one person’s decisions would affect the actions of dozens of others. And that’s the second detail. As I scanned the room, I was struck by the asymmetry between executive decisions and individual action. In my mind, I saw an upside-down pyramid, where the time of many rested on the decisions of a few. Most people in the room were product managers, designers, or team leads. Each one would take Marissa’s decision back to their team; they’d talk about what to do, make a plan, and get to work. I thought about those people—the ones who weren’t in the room—and pictured them as another layer of bricks in the pyramid of time. We couldn’t see them from our seats around the conference table, but I knew that their time also depended on the decisions in the room. It was heavy. I’ve never been a manager or an executive. But I’ve worked with lots of them. During my time at Google Ventures, I was constantly advising founders and leaders at startups. We would talk about product decisions, marketing decisions, team decisions. I remembered my experience at Google, and realized that all of these decisions were really time decisions. When a leader asks for another round of design improvements… or calls a meeting to discuss a project… or says they don’t believe in customer research and wants to wait until they can get real data from the market… those decisions about process and strategy are also decisions about how the team will spend their time. When Jake Knapp came to GV, we began using design sprints to help startups make better use of time on their most important projects. We required leaders to participate in these sprints as a way of showing them how decisions about process and culture could benefit everyone involved. For one week, in a sprint, we replaced workplace defaults like constant digital messaging, fragmented schedules, and consensus-seeking with new behaviors: focusing on one thing at a time; giving individuals space to thoughtfully develop ideas; communicating in-person without devices; making crisp decisions from an opinionated point-of-view; and working at a sustainable, healthy, human pace. Meanwhile, Jake and I had become obsessed with rethinking the defaults about time, attention, and energy in our own lives. We experimented with using distraction-free phones, waking up super early, and giving up to-do lists. Inspired by the success of these experiments, our results with design sprints, and the feedback from friends and strangers who tried our ideas, we decided to turn all this thinking into a book called Make Time. It’s a handbook for anyone who wants to reclaim control of their attention and energy so they can make time for what matters to them. But I haven’t stopped thinking about how leaders’ decisions affect how we spend our time. And since the book came out, a lot of people have asked me the same thing: How can I use Make Time with my team? It’s an important question, because the choices that other people make have a direct effect on how we spend our time. That effect is amplified when the “other people” making choices are leaders. I’ve seen it in every team I’ve been a part of, and I watched it become clear and vivid in my meeting with Marissa Mayer. So I decided to write down a list of ideas for leaders—ways that executives, managers, and decision-makers of all kinds can make decisions that help their teams make time for what matters. Since you’re reading this story, maybe you’re a leader yourself. If you are, take these ideas as experiments you can run, and start testing them tomorrow. These tactics can have a profound effect on how your team spends their time, but they don’t require tectonic shifts to implement. Start small, start today. For everyone else: I think you’ll find that each of these ideas can be applied as tools for teams or individuals. You don’t need permission to improve how you and your coworkers spend time at work. Once you start thinking about your decisions through this lens, you’ll see the changes compound, and you can start a dialog with your boss and the rest of your organization. Everyone wants to make good use of their time—sometimes they just don’t know where to start. My best time-making ideas for leaders fall into three categories: the environment you create for your team, the implicit and explicit expectations that you have, and the example that you set with your personal choices. Let’s take them one by one. The physical and cultural environment of your company has a huge influence on how people spend their time at work. Here are five ways to improve it. It seems like every day there’s a new tool or process you could adopt at your company—an app or service promising better communication or smarter collaboration. But these products rarely deliver on their promises. And when you’re overeager about trying the shiny new thing, it can have the opposite effect: People are fragmented, scattered, and bogged-down trying to incorporate the new tool. To avoid the temptation, I encourage leaders to think of new tools like debt: It can be useful, but it comes with a very real cost. Before you add a new product, process, or platform to your company, ask yourself whether it’s really worth it. Blocking your calendar (aka scheduling time with yourself) is a simple and defensible way to make time for the work that matters. (It’s tactic #9 in Make Time.) You can supercharge this tactic by agreeing to block your calendar as a team. When everyone in a group or department has the same “do not schedule” blocks on their calendar, it’s much easier to spend that time on focused work. Large teams have more overhead than small ones. Complicated projects have more unknowns than simple ones. Long timelines encourage people to take on unnecessary work. This probably seems obvious, but my experience is that most leaders make things bigger than they need to be. Keep teams, projects, and timelines as small as possible. Ironically, most offices are not great for getting work done, and open floorplans deserve most of the blame. Moving walls may not be realistic, but you can change the default behavior of your team by instituting Library Rules. This is a brilliant suggestion from Jason Fried: Swap one default (you can talk to anyone anytime) with a different default, one that everybody already knows (act like you’re in a library). The 21st Century workplace is full of rewards for long hours and fast responses: compliments, promotions, and cultural badges of honor. Try rewarding the opposite. Instead of “thanks for getting back to me so quickly” on an after-hours email exchange, encourage the person who takes the time to write up a thoughtful response or proposal. So much of what drives our culture of constant busyness is expectations. And guess who creates those expectations? That’s right. You do. Here are five ways to reset your company’s default expectations and take better care of your team’s time. Teams have so many ways to keep in touch. Which one is appropriate when? Create the right communication expectations by helping your team decide between email, chat, meeting, or call. It doesn’t literally have to be a contract, but your company’s culture should include a shared intuition about when and how to communicate. Think about timeliness, thoughtfulness, interruption, and synchronicity as you plan your contact contract. A better way to keep tabs is to ask your team for summaries, not status updates. It’s a semantic difference, but it’s significant. Summaries come at the end—they mark a milestone or the completion of a project. They explain the lessons learned and the results of the work, and indicate what needs to happen next. The best part about summaries is that your team can anticipate them. When they know you’re expecting a summary at the end of the week, or the end of the design phase, or after launch, they can plan their work around the data and lessons they know you’ll want to see. Getting everyone to agree before moving forward is a nice idea. But it’s a huge waste of time because consensus is not realistic—especially for diverse, thoughtful teams. And there’s another problem, which is that consensus-driven decisions tend to be muddy and risk-averse. I’ve seen how teams benefit from crisp, opinionated decision-making, and we built this into the design sprint process. The key is to collect input from the team, consider your options, then make the decision (you’re the decision-maker! ), explain it, and move on. Your decisions about your time set an example for your employees. When you value busy work over real work, or accept interruption as an inevitable default, your team assumes that’s how they should behave too. Want to give your team more time? 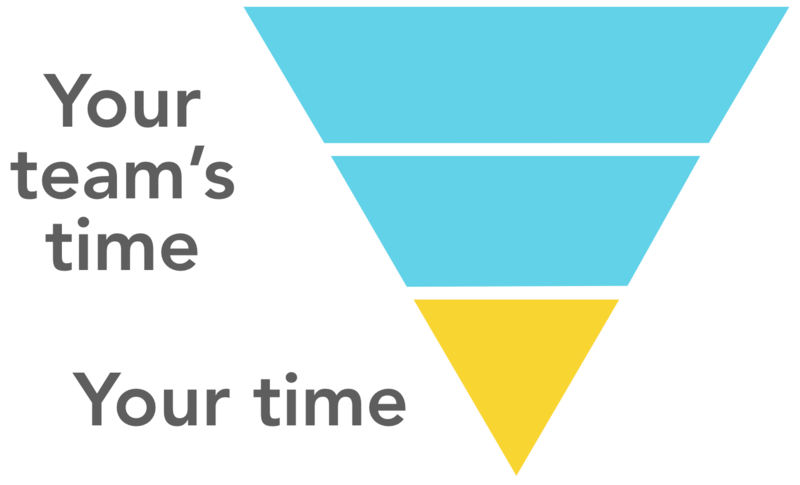 Start making better decisions about how you value your time. Here are five ways to do that. As a leader, you want people to know you’re available any time. So, online and reachable becomes the default—not just for you, but for the whole team. Unfortunately, projecting presence (whether online or in person) sends the message that it’s okay to be interrupted—that this company values the appearance of availability over the time and focus needed to do great work. Take the time to thoughtfully write updates, proposals, directives, summaries, and questions. Don’t “think out loud” in a meeting. Don’t make a decision on the spot. Don’t share your opinion with whoever happens to be around. Give your work the mental space it deserves by writing it down, and set the example that your team should do the same. Planning is fun, because it’s how you imagine a bigger and better future for your company. But most plans are guesses. They only describe what you’ll do, and they can’t anticipate how the world might change around you. So make plans when you need to, but avoid spending time on elaborate roadmaps or abstract visions. Instead, focus on progress: How will you make this—your product, service, or company—better right now? Leave the office early. Take a weekend getaway. Go on vacation. And when you do, tell your team you’ll be out of the office and offline. Delegate people to make decisions while you’re out, or defer those decisions until you come back. Real breaks will make you a better leader and a happier person, and you’ll set a healthy example for your team. The decisions you make as a leader have a direct and immediate effect on how your employees spend their time. Perhaps that’s obvious—you are the boss, after all. But if you’ve ever wished for better work, greater job satisfaction, or less stress for your team, you have the power to make those changes by rethinking the decisions you make about time. And the 15 ideas in this story are a great place to start. The real power of these choices will be revealed over time. That’s because new behaviors have a funny way of becoming defaults. What sounds crazy and new right now will seem normal and inevitable in a couple of years. Defaults tend to stick around unless you make a point of changing them. Their results can compound like investment returns, but they can be a drag on your team’s productivity and happiness if they’re no good. Nobody ever looked at an empty calendar and said, “The best way to spend this time is to cram it full of random meetings!” Nobody ever said, “The most important thing today is everybody else’s whims!” Of course not. That would be crazy. But because of defaults, it’s exactly what we do. You can break the cycle today by creating new defaults. I look forward to seeing how the investment pays off for you.